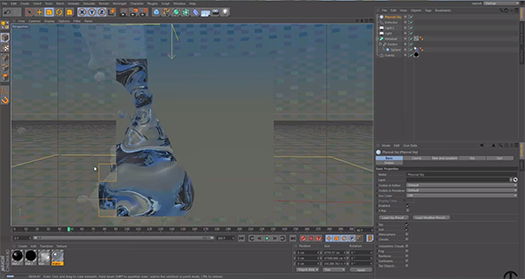 In this tutorial Ignace Alyea describes how to simulate liquids in Cinema 4D. This simulation will happen through the help of Metaball. Metaball helps us to create the blobby surface calculation between two mesh objects. First we will create a small sphere which will be our particle shape. Then create a 2D particle emitter. Now make the sphere as the shape instancer for the particle, which means now the emitter will emit the spheres a s a particle . you can drag and drop the sphere in to the emitter from the outline list. Remember to check on the 'show object' option from the emitter properties. Now as we have already created the basic particle emission add metaball and connect it with the emitter. now you can see the particles as a mesh object. Now decrease the editor subdivision for getting the better or smooth result. Now increase the birth rate of the emitter and also add a gravity to make the liquid fall. To make effect this liquid with a object create a box and make the box as rigid body to make the liquid to collide with the box.